An intensely satisfying drama of rugged primitive justice, THE MAN FROM LARAMIE marked the final, and finest, collaboration of one of the most important teams in Western films: director Anthony Mann and star Jimmy Stewart. Together this perfectly-matched pair provided audiences with eight classic pictures, including Winchester '73 and Stategic Air Command. Under Mann's superb direction, Stewart de… parts from his well-loved "ordinary hero" role and gives a riveting performance as a resolute vigilante obsessed with finding the man responsible for his brother's death. Among the suspects are an arrogant cattle baron, his sadistic son and his ranch foreman. One explosive confrontation, in which Stewart is dragged by a wild horse and shot in the hand at close range, is one of movie history's most memorable sequences. 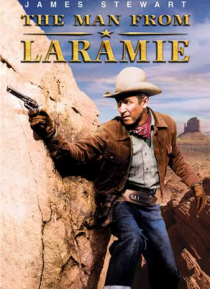 Among the first Westerns filmed in CinemaScope, THE MAN FROM LARAMIE uses the widescreen technology to emphasize the scope and power of this harrowing action-drama, making it a perfect example of the Western as America's epic art form.